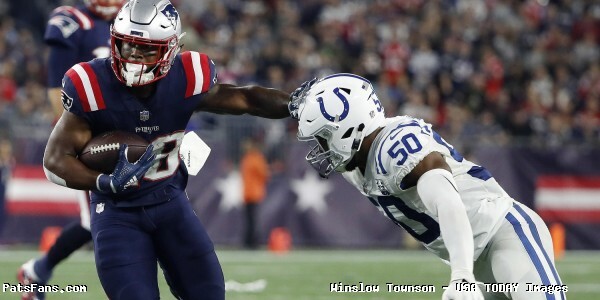 The Patriots offensively were looking much more like the team that steamrolled thru the first 10 games in the season than the one that slept-walked thru consecutive losses at the end of the regular season in New Jersey and Miami. After re-watching the game a few times since Saturday afternoon, it is apparent that the return of Julian Edelman was a huge key for the Pats offense in their 27-20 victory over the Kansas City Chiefs in the Divisional Round. His presence in the short passing game garnered a lot of attention from a good KC secondary. As a result, they were able to move the chains effectively especially on third down. Prior to Edelman being hurt the Patriots were humming along with 54 of 107 being converted on third downs. Once he was injured that percentage plummeted to 34 of 108. 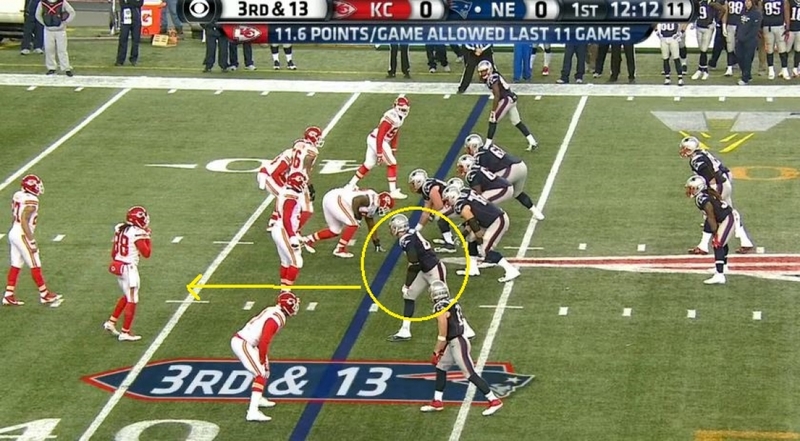 On Saturday against a good KC defense, the Pats converted 6 of 12. Coincidence? Not hardly. An even bigger factor of having Edelman back is teams can’t overload on covering Rob Gronkowski and he was extremely effective on Saturday with seven catches for 83 yards and two big touchdowns. Edelman shook off the rust (?) to the tune of 10 catches for 100 yards. Moving forward, this unit will not be easy to stop. 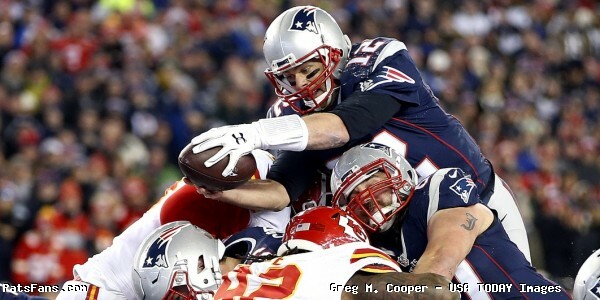 Gronk 32-Yard Catch: On the Pats opening drive they faced a 3rd and 13 from the KC 43-yard line. The Patriots go to a four-wide look with Gronkowski in the slot on the left. Brandon Bolden in the deep back lined up next to Brady on his left, ostensibly to pass block. 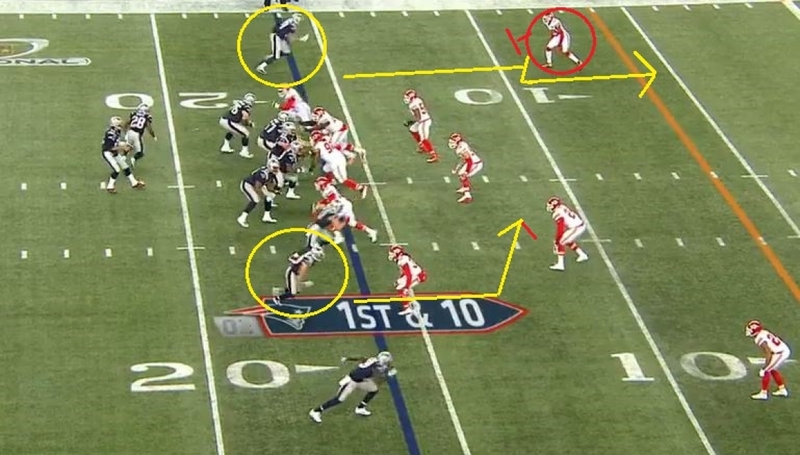 KC is showing a different look with just on down lineman and four players standing near the line of scrimmage. The safeties are creeping up into the box, possibly showing blitz. At the snap Gronkowski runs a deep dig to the middle of the field and then cuts back to the left where once Brady hits him with the ball, he has a lot of room to run. He rumbles for 32 yards setting the Patriots up at the 11-yard line for a first down. 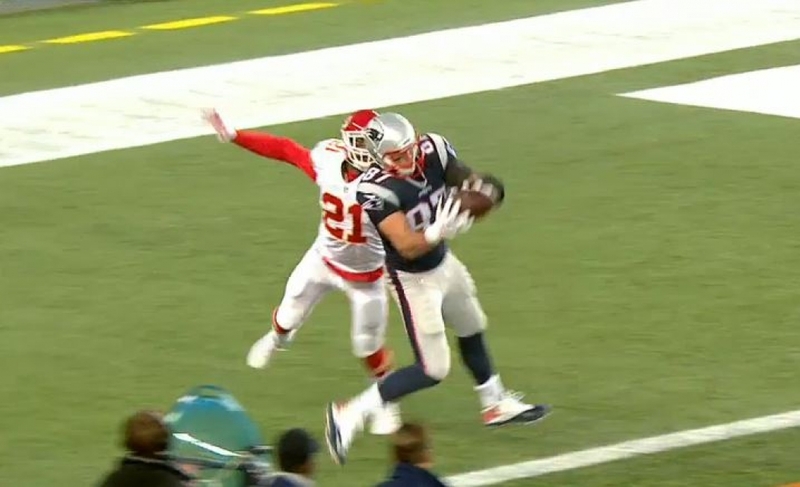 Gronkowski 8-Yard Touchdown: On the same drive, facing a 3rd and 7 from the 8-yard line, Brady once again spreads the Chiefs wide. Edelman in the slot on the left runs a slant to the middle. James White is the lone back this time to Brady’s right. Amendola and LaFell are lined up on the right. 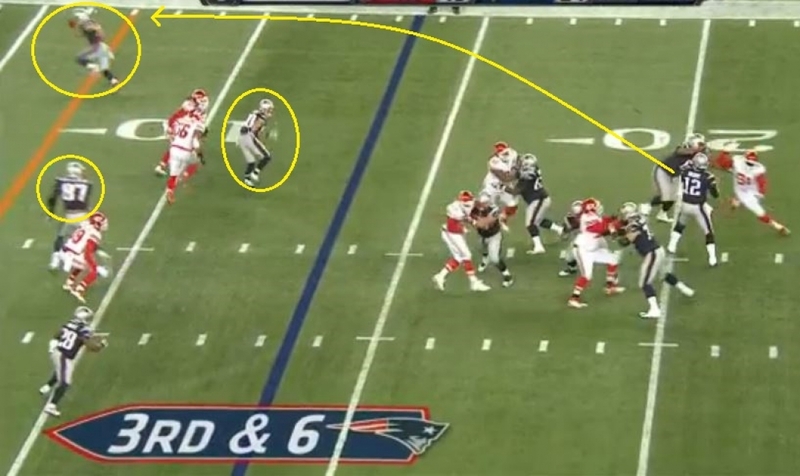 This leaves Gronkowski with single coverage with CB Sean Smith on the outside on the left. He has the size mismatch and Gronk runs a deep out and boxes Smith out where Brady throws a perfect pass to Gronk’s outside shoulder where Smith has no chance to stop it. An easy touchdown and a great start for the offense. 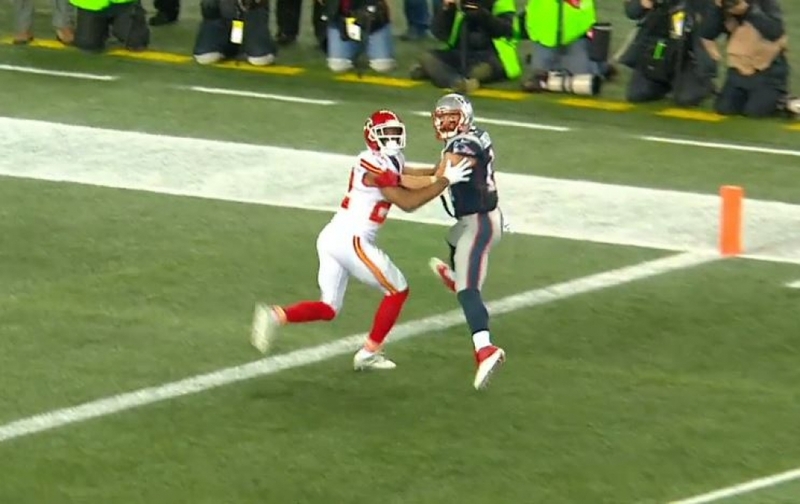 Gronkowski 16-Yard Touchdown: Later in the third quarter after the Chiefs turned the ball over the Patriots moved down to the KC 16-yard line. 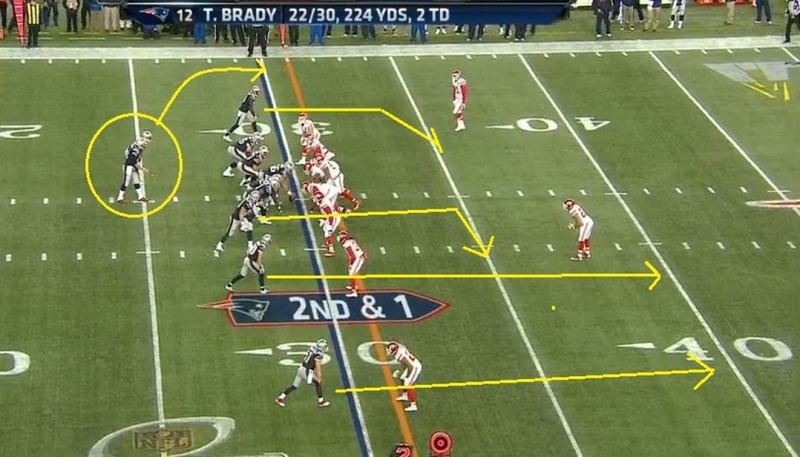 There they faced a 1st and 10 where Brady again spread out the defense. With three wide right and Edelman in the slot, he ran a short cross drawing the defense and the safeties to move down to try to limit his room to maneuver. 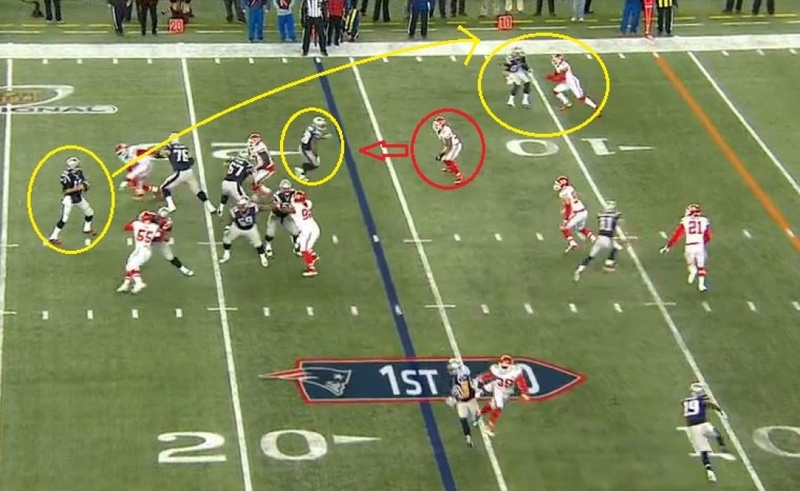 Gronkowski this time was lined up wide left with just a safety in coverage, this time Eric Berry. James White was the lone back to Brady’s left. 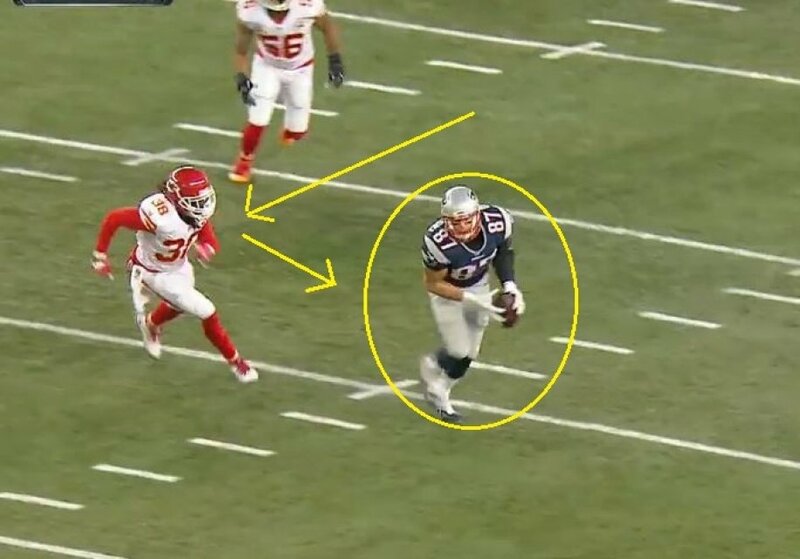 At the snap Gronkowski ran a six-yard route and stopped as if on a comeback route. White floated out in the flat and the linebacker who would have been in the throwing lane for Gronk’s comeback had to move up to take him. Berry took the bait and flew up to contest the throw. 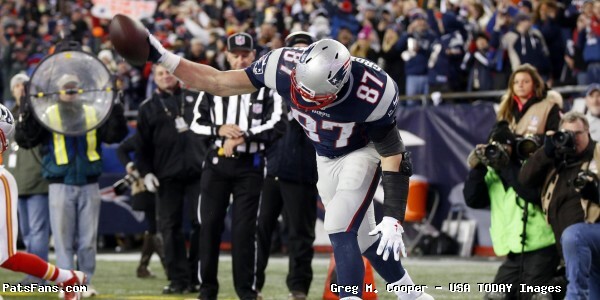 Brady pumped faked and Gronkowski turned and beat him easily for a touchdown lob from Brady for six. That put New England up 21-6 and was a huge shift in momentum. James White 29-Yard Catch and Run: Another big play in the passing game was later in the game and featured running back James White. 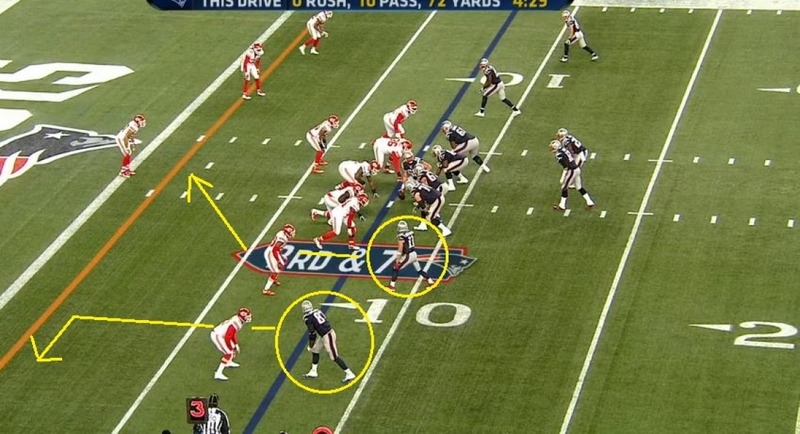 They were facing a 2nd and 1 from the 31-yard line after a nine-yard pass to Edelman on first down. 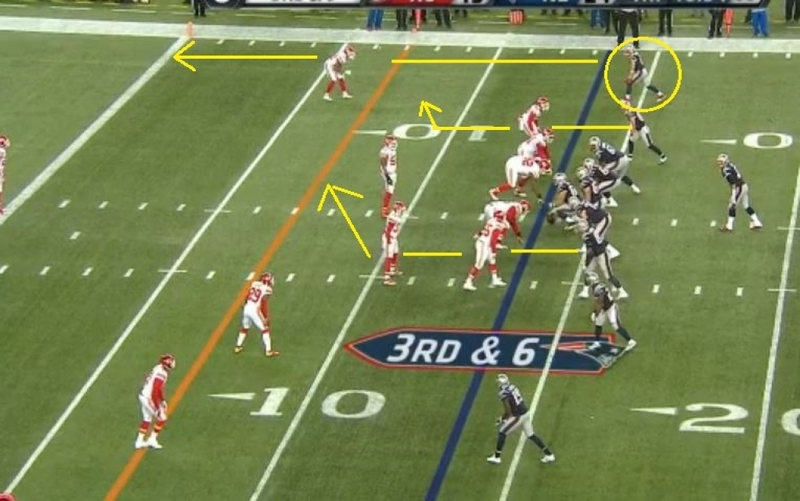 Again, the Patriots were spreading out the KC defense with three wide right and only Brandon LaFell to the left. Edelman was wide right, with Amendola inside of him and Gronkowski in the right slot. At the snap LaFell ran a dig route to the inside from the left, and White floated out to the flat and caught a short flare from Brady that was open due to LaFell drawing his coverage inside. White had an easy first down and one man to beat, which he used his speed to do so and had a lot of room to run due to Gronkowski and Edelman drawing the lion’s share of coverage to the right side. He raced down the sideline and gained 28 yards after the catch for a big gain. No-call on Edelman: Here’s the one that got away; facing a 3rd and 6 from the KC 13 and a half yard line, Brady had the Patriots in a five wide spread. Edelman and Amendola were split wide right, Gronkowski, LaFell and James White in the slot were split wide left. At the snap Amendola crossed behind Edelman to run a short out route. Gronk ran a post. 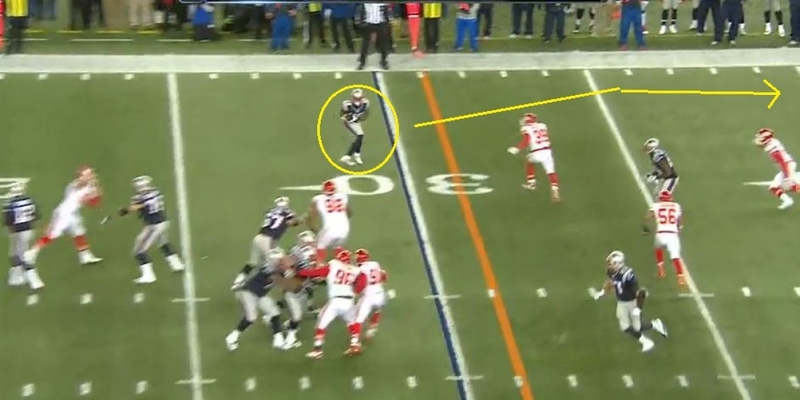 Edelman tried to beat Marcus Peters to the corner running straight down the sideline. Peters makes a lot of contact at the goal line well after the five-yard rule and grabs two handfuls of Edelman’s jersey. The ball fell incomplete but at a minimum should have been an illegal contact call and with the ball in the air should have been a Defensive Pass Interference. Brady did have Gronkowski in the middle for a first down but wouldn’t have gotten much more as there was a safety right over the top of him. But he was going for the kill shot. With the non-call, they Patriots had to settle for a field goal. The Patriots offense is in much better shape going to Denver for this go around as they have both Edelman and Amendola who were out the last time. This should be a great matchup which we’ll have much more of soon. 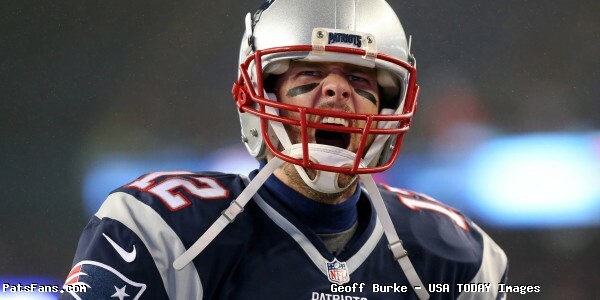 This entry was posted in Patriots Commentary, Patriots Film Room, Patriots News and tagged 2015 NFL Season, 2015 Patriots, 2015 Patriots Season, Bill Belichick, Brandon LaFell, Danny Amendola, Denver Broncos, Eric Berry, James White, Julian Edelman, Kansas City Chiefs, LaGarrette Blount, Marcus Peters, New England Patriots, NFL, Patriots, Patriots edge rushers, Pittsburgh Steelers, predictions, Rob Gronkowski, Rob Ninkovich, Tom Brady on January 18, 2016 by Steve Balestrieri. The Patriots season in essence begins on Saturday as they take their first step in attempting to repeat as Super Bowl champions. Their opponent in the Divisional Round of the Playoffs are the Kansas City Chiefs. The game is scheduled for 4:35 p.m. at Gillette Stadium. The game will be televised by CBS with their announcing crew of Ian Eagle, Dan Fouts and Evan Washburn on the call. The game can also be heard on the Patriots flagship radio station of 98.5 the Sports Hub with the voice of the Pats Bob Socci on the call with Scott Zolak. The Patriots (12-4), as the AFC’s #2 seed faces the highest remaining seed which are the Chiefs while Denver faces the lowest remaining seed, the Pittsburgh Steelers in Denver. Kansas City (11-5), is the NFL’s hottest team having run off 11 wins in a row and on Saturday thrashed the Houston Texans on the road 30-0. They haven’t dropped a game since a road loss to the Vikings left them for dead at 1-5. The two teams have never met in the postseason but the Chiefs curb-stomped the Patriots in Arrowhead last year 41-14 on MNF. Defense is Excellent Across the Board: When looking at the Chiefs defense, they play the classic 3-4 with three big down linemen and have an outstanding linebacking core. During the 11-game winning streak, they allowed an average of 11.6 points per game. The Chiefs have outstanding bookend pass rushers in Tamba Hali and Justin Houston although both are a bit dinged up right now. But the Chiefs registered 47 sacks on the season and most came from the (pardon the wrestling pun), the Triple H’s; with Houston (7.5 sacks), Hali (6.5 sacks) and Howard with 5.5. The pass rush against Houston was particularly effective up the middle with Dontari Powe and Jaye Howard pushing the pocket back in Brian Hoyer’s face. Powe and Howard are outstanding at the point of attack; they can take on double-teams and stuff the run or allow inside line backers Josh Mauga and Derrick Johnson to make plays. Their active and are good laterally as well. The Chiefs secondary is outstanding with corners Sean Smith and rookie Marcus Peters who had eight picks this season. Opposing QBs targeting Peters had a 67.7 passer rating this season. Safety Eric Berry is recovered from his cancer treatment and plays down in the box and is very active. Many Patriots fans will remember S Hussain Abdulla from the pick-six he returned against Tom Brady a year ago. Maclin’s Absence Could be Key: Chiefs top wide receiver Jeremy Maclin suffered an injury during the Texans game and it was initially thought to be an ACL injury but he’s been cleared for that. He did suffer a high ankle sprain which may keep him out of this weekend’s game. Even if he does play, an ankle sprain may limit his effectiveness and Maclin has been their most productive WR by far in 2015. He’s caught 87 passes for 1088 yards with eight touchdowns for KC this season. The next most productive wide receiver is Albert Wilson with 35 catches for 451 yards and two touchdowns. If Maclin can’t go it would put more pressure on QB Alex Smith to find their excellent tight end Travis Kelce in the passing game as their best option. Maclin’s either limited status or absence will probably put Kelce on the Patriots radar as the player they most have to take away. Smith Leads a Varied Offense: The Chiefs offense may be one of the most balanced that the Patriots see this season. They’re almost 50/50 with runs and passes with 473 passes attempted and 436 runs. Last season their offensive line dominated up front and the KC rushing attack gashed the Patriots for 207 rushing yards. With the dangerous Jamaal Charles on IR, the Chiefs turned to Charcandrick West, who averaged 4.0 yards per carry while racking up 634 yards and four scores as well as Spencer Ware who averaged an impressive 5.6 yards per carry while gaining 402 yards as well on the ground. They use some three tight end packages as well. But Andy Reid will mix it up; you’re as likely to see a run from the 3-4 WR spread as you are a pass from the 3-TE sets. Smith is a very mobile quarterback who can hurt you with his legs as he was the Chiefs 2nd leading rusher this season with 498 yards. Knile Davis had only 28 carries this season but gashed New England for 102 yards on 16 carries last year. Smith won’t throw the ball deep much or try to take many chances with low percentage throws, he’s careful with protecting it and had only seven interceptions this season. Besides Maclin, their biggest target is Kelce who is used in much the same manner that the Patriots use Rob Gronkowski. Kelce will line up in-line, in the slot or split wide. He’s very good at generating yards after catch and will attack the seams. He had an impressive day against Houston with eight catches for 128 yards. On the season he caught 72 passes for 875 yards and five touchdowns. Kelce will undoubtedly draw the lion’s share of attention from the Patriots defense and he’ll be a handful, much like Gronkowski is. They like to use secondary wide receiver Wilson in the running game, they’ll put him in motion and run the Jet Sweep and try to catch the defense over-committing. Rookie WR Chris Conley chipped in with 17 catches for 199 yards and a touchdown. West was effective out of the backfield with 20 catches and a 10.7 yard average per reception. Turnover Battle Will Be Tough to Win: The Chiefs are outstanding at forcing turnovers. During the current 11-game winning streak, they’ve generated 28 turnovers and have a +20 turnover differential during that time. They’re remarkably solid at not turning the ball over via fumble or interception and have been outstanding at generating them. With an offense that doesn’t generate a ton of big plays in the passing game, they feast on opponents’ mistakes and making them pay. The Patriots are also one of the stingier teams in the league in regards to turnovers as they once again led the league with the least amount of fumbles in 2015. Tom Brady also threw only seven interceptions on the season as well. So one wouldn’t expect a lot of turnovers in this game and any generated by either team would be big. Special Teams Will Bear Watching: As we witnessed on Saturday afternoon, the Chiefs special teams units can strike quickly. Knile Davis took the opening kickoff back 106 yards for a touchdown which quickly took the crowd out of the game and put the Texans firmly on the hot seat. The Patriots special teams have had their issues in the second half of the season and the last thing they need is to give up a quick score to turn momentum or give the Chiefs a short field. With the injuries to Julian Edelman and Danny Amendola, the Patriots punt return unit hasn’t been as effective as they’ve been in the past. The Chiefs punt coverage unit has been solid, allowing only six and half yards per return. Half of Dustin Colquitt’s 75 punts have been downed inside the 20-yard line this season and he had only five touchbacks. Cairo Santos missed seven field goal attempts this season and was only 4 of 8 from 50 yards and beyond. 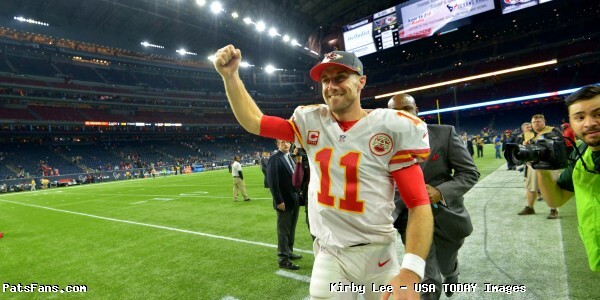 This entry was posted in Patriots Commentary, Patriots News and tagged 2015 NFL Season, 2015 Patriots, Alex Smith, Bill Belichick, Brandon LaFell, Danny Amendola, Dontari Poe, Eric Berry, Jamaal Charles, Jaye Howard, Jeremy Maclin, Julian Edelman, Justin Houston, Kansas City Chiefs, Knile Davis, Marcus Peters, New England Patriots, NFL, Patriots, Patriots edge rushers, picks, Rob Gronkowski, Sean Smith, Tamba Hali, Tom Brady, Travis Kelce on January 11, 2016 by Steve Balestrieri.